Metal Polish is recommended for use on brass, copper, chrome, stainless steel, aluminum, magnesium, silver, gold, porcelain, fiberglass, Plexiglas, hard plastics, and painted surfaces. Removes oxidation, tarnish, surface rust, and water spots. 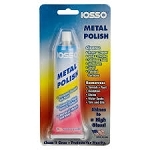 Iosso® Metal Polish is a one-step cleaner that easily restores the shine to these metal surfaces. Easy to use, just rub on, and then buff off. It may be used with a buffing wheel. It leaves a brilliant shiny yet protective coating that lasts for months.